“Advance Flat Rate Shipping Method ” plugin opens the possibility to create customize shipping options. WooCommerce offers few default shipping rate options but based on your country rules and regulation and nature of your business, you always need more options to setup the shipping rates in our stores. With“Advance Flat Rate Shipping Method” we provide you options to create as many flat rate shipping methods you need and can set the custom rules as per your need. You can configure the flat rate shipping for – ‘Specific product’ , ‘Specific category’ , ‘Specific Tag’ ,’Specific classes’ etc. Flat Rate Shipping Method For Countries OR Specific Countries. #1.Flat Rate Shipping Method For Countries OR Specific Countries. You can set countries where you want this shipping method to be applicable (available).This shipping method will only listed in the countries which you have picked here. Flat Rate Shipping Method For specific Countries. Use this feature when you want to make the shipping method visible only for specific products. For example, if you select “Basketball” as product, the current shipping method will only be visible if the customer has added “Basketball” product in his current cart. Using this feature you can restrict your shipping method to be visible only for products of specific category. For example, you can create a new method like “Expensive Shipping $50”. This method should be visible only when the cart has any product from “Glass Products” category. For example, you can create a new method like “Special shipping $100”. This method should be visible only when the cart has any product having “fragile” tag. Using this feature you can restrict your shipping method to be visible only for products of specific SKU. For example, you can create a new method like “Christmas Urgent $50”. This method should be visible only when the cart has a product of “CHRISTMAS007” SKU. When you want to make a shipping method visible only for selected user you can use this feature. For example, let us say you want to create a shipping method for your favorite buyer called “Special Shipping for JamesSmith – $10” for all his bulk orders. In this case, you have to chose James user-name in this text-box. Then this shipping method will only be visible to JamesSmith. When you want to make a shipping method visible only for users from a specific group/role you can use this feature. For example, let us say you want to create a shipping method for all your wholesale customers called “Wholesale Shipping – $100” for all bulk orders. Then you can select the “wholesale” in this textbox. Using this feature you can restrict the shipping method only to be visible if the specified coupon is used on the current order. For example, let us say you want to offer a discounted shipping rate for your email campaign. You can create this method like “CyberMonday 2016 Shipping $5”. and this will be only visible if customer uses the coupon you shared on your email campaign “CyberMonday2016”. You can achieve this using this feature. Here you can enter maximum order amount to for which the shipping method should be visible. Here you can enter minimum order amount after which the shipping method should be visible. For example, you can specify this like 500. In this case, the shipping method will only be visible to customer if the order amount is greater than and equal to 500. For orders smaller than 500 it will not be visible. You can use this feature, when you want to skip shipping charge when the order amount is less than what you specified. Here you can enter maximum cart/product weight for which the shipping method should be visible. Here you can enter minimum cart/product weight after which the shipping method should be visible. For example, you can specify this like 500. In this case, the shipping method will only be visible to customer if the cart weight total is less than 500. For cart having greater than and equal to 500 weight it will not be visible. You can use this feature, when you want to skip shipping charge when the cart total weight is higher than what you specified. Here you can enter maximum cart quantity for which the shipping method should be visible. 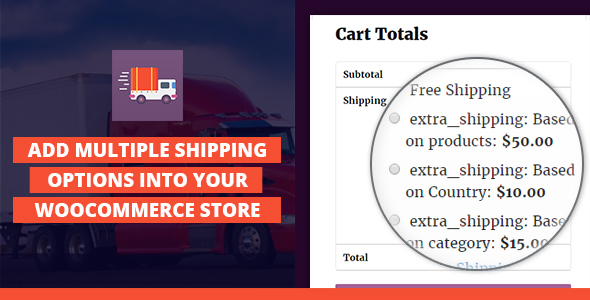 Here you can enter minimum cart quantity after which the shipping method should be visible. For example, you can specify this like 5. In this case, the shipping method will only be visible to customer if the cart quantity is greater than and equal to 5. For cart having less than 5 quantity it will not be visible. You can use this feature, when you want to skip shipping charge when the cart quantity is less than what you specified. This option allows user to add extra cost based on shipping classes. It provides all shipping classes which are already used for product. It displays all shipping classes list with text box to add cost. The shipping class cost will be added on the top of main cost. For example If you set $10 as main cost and also add $5 cost on particular shipping class “microwave crockery”. So, if user buys “microwave bowl set” and this product have “microwave crockery” shipping class then this shipping method is apply on cart but the cost is $15 ( $10 [main cost] + $5 [Shipping class cost]. Advance Flat Rate Shipping Method For WooCommerce will translate based off your WordPress language setting by default. The rest of the plugin was also developed with localization in mind and is ready for translation. Currently, In our plugin will support English and Spanish language. If you would like to add more language then please generate .mo file and load in our plugin. jqueryui (comes with WordPress 3.8+) Latest browser, like Firefox or Chrome.